On a brisk fall evening in Wichita, “The Sounds of Madness” could be heard coming from the Intrust Bank Arena. I arrived at the arena three hours before the doors opened for the show for an interview with Mark Vollelunga of Nothing More, and fans were already grabbing that coveted first spot in line. As we walked by a young lady, we asked, “Are you already waiting in line?” She said, “Yes, I want to make sure I am right up front for this one.” She was right; this was a night not to be missed. Opening the show from San Antonio, Texas, was the band Nothing More. 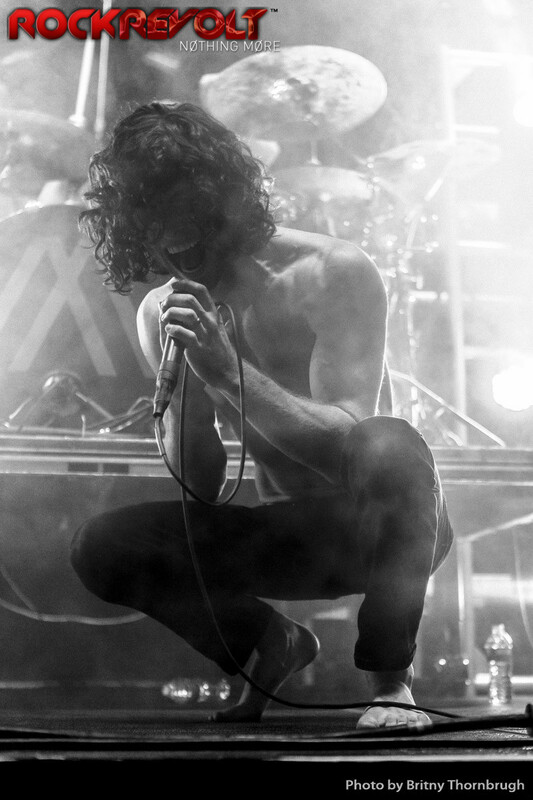 Fresh off of their own headlining tour, they were eager to be kicking off such an amazing tour. As the band hit the stage, I was crouched down in the photo pit taking it all in. The roar of the crowd blew me away, as this was the start of the night. As they tore in to “Christ Copyright,” the energy levels quickly spiked through the roof. Up next was a song that is very near and dear to front man, Jonny Hawkins. “Jenny,” a song for his aunt and sister who struggle with various forms of depression and schizophrenia, is one that has helped raise awareness for the disorders. The whole band poured themselves into playing “Jenny”, which really showed that they were there for support. After “Jenny,” one of the most unique bass solos ever seen lit up the stage. Bass player Dan Oliver created a custom bass rig with a bass that spins on all axis and can be played by all the members of the band at the same time. This is truly a sight to see. The showmanship did not stop there as they saved an incredible drum display to close out the show with “Salem.” Again, all the members of the band got in on this drum bashing extravaganza. Nothing More definitely set the stage for an exciting night of music, and they set the bar high for everything that was to follow. 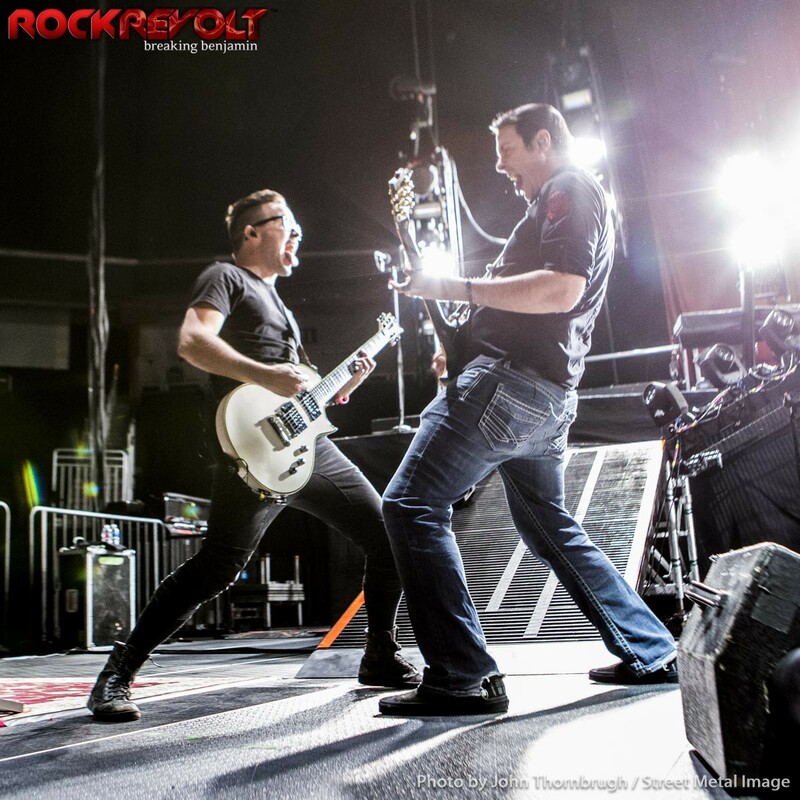 Up next was the first of the two co-headliners, Breaking Benjamin. As I was standing to the left of the stage, I could see Ben and the guys waiting to come to the stage. The all had a look of focus and determination on their faces as they prepared to give their all to the fans, and that they did. As the first bars of “So Cold” rang out across the arena, the fans went insane. It was obvious that the crowd had been waiting a long time for the return of this band. There was also that feel that Breaking Benjamin has also been waiting to get out in front of the fans in this capacity for a while, too. It was apparent to all that they were ready to let it all go. Next was their latest single “Angels Fall,” and the crowd still sang along to every word to their latest single as if it was released years ago. The first special treat by Breaking Benjamin came in the form of a cover of Queen’s “Who Wants to Live Forever,” and no this beautiful rendition was not sung by Ben; it was, in fact, sung by guitarist Keith Wallen. I say beautiful because it was. I do feel that Mr. Mercury and the rest of Queen would feel that they did this song justice. The hits just kept rolling with fan favorites like “Blow Me Away”, and new songs from Dark Before Dawn, like “Failure,” kept the fans wanting more. As “Breath” started to blast through the arena, I was taken back, as that song has been a favorite of mine for a long time. To be able to hear it live again was an awesome feeling for me. I really hope other fans get that same feeling when they hear certain songs like that. After “Breath” was another awesome cover, this time manned by bassist Aaron Bruch. His rendition of “Aenema” by Tool was equally awesome and gave the fans another great moment for them to remember. Now, before my favorite part of the set, came “Poyamorous.” I truly enjoy the fact that they are still playing the song that first got Breaking Benjamin on the airwaves and into people’s ears. It shows they are in touch with their roots. Okay, now for my favorite part of the set. The arena went black and all we could hear was the woosh of a Lightsaber. The only thing visible was its ominous red glow from the top of the scaffolding. Then, as the light hit Ben and he announced his allegiance to the Dark Side of The Force, we could all hear the pounding of “The Imperial March”. There were nothing but flashing red lights in an otherwise pitch black arena. The fans went crazy, and I stood there with goose bumps. Then, as it was ending the sounds of “Schism” could be heard coming out of the speakers, followed by a roar of the crowd. Then “Smells like Teen Spirit” came wafting through the arena. They were not done with their mix up of melodies as they ended it with a little “Walk” by Pantera. It was just one of many awesome moments the fans got to experience throughout the night. So it can’t get any better during this Breaking Benjamin set, right? Oh, it can, and it does. For “Until the End”, Ben asked for all the lights to be turned off and for everyone in the audience to turn on their cell phone lights. The entire place is lit up almost as if it were daylight in the arena. While all of the little white lights in the arena are pointing toward him, Ben gave a moving speech about having a light inside of each of us to drive our own lives. It was a very powerful moment from man who truly loves his fans, band, and family and has used all of their lights to guide him forward to where he is now. Guess what, it still is not over. To close out the set, Ben invites a young girl of about ten years old and her father on stage to finish out the night. Once the girl makes it to the stage, Ben makes sure to point out to her that while she bravely climbed over the barrier and up the stage, her father chose the easy way out and took the side stage stairs. It was a great moment of comic relief. Once he got everyone settled, the band ripped into the final song of the night, “Diary of Jane” to the fans’ delight. As the band did their closing salvo, Ben strapped the guitar on the girl and let her play out the ending. It was an awesome sight seeing Breaking Benjamin again on the stage. I have to say, for a man who was given the opportunity to speak with Ben about the upcoming tour and hearing the sincerity in his voice for his love of the fans and all the supporters around him, I truly feel that he is going out there and trying to give that love back in the best and only way he knows how. As if all that was not enough, we still had co-headliner Shinedown to take the stage, and take it they did. Again standing to the left of the stage awaiting their arrival, I was not able to see much. As the curtain dropped, I could feel the energy and excitement pulsing from the crowd. 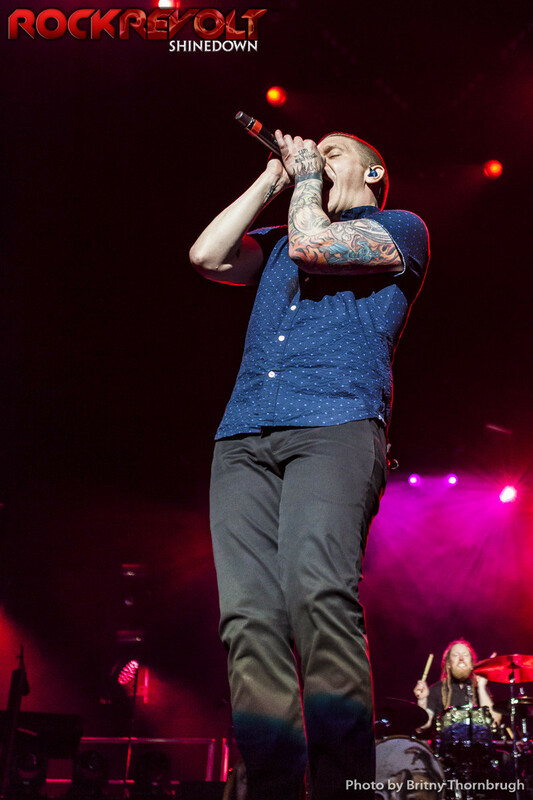 And they all seemed amped up for one reason: lead singer Brent Smith. This was the first time I had seen the band since its transformation, and I have to say, it was a good one. Always one to bring excitement and energy to the stage, it seemed that he was able to bring so much more, and it carried over the stage as the whole band seemed to have a new found life to them. Starting off the set was “Cut the Cord” off of the new album Threat to Survival. What a way to start off the night! The fans seemed to know all the words to a newly released song, and I know when the pyro started to blow, it took the top off of the arena. They continued on with “Fly From the Inside.” Flame projectors in tune to the beat of the song made quite the spectacle to see, and the crowd dug in and took one hell of a trip for the rest of the night. Mr. Smith seemed to be having a good time toying with the crowd, asking them for more and more. With the slight wave of the hand, he would let them know he thought that they could do better, and yes better they did as the night went on. It was a great night of music from Shinedown, as they played crowd favorites such as “The Crow & The Butterfly” and “Diamond Eyes” to the live debut of “State of My Head”, which was well received by the fans in the arena. Again, greats like “Save Me” and “Second Chance,” which was supposed to be their final song of the night, reminded everyone of the great catalog of music that Shinedown has rolled out over the years. As the lights went down and the crowd stirred, two spot lights came on. On the left side facing the stage stood Brent, and on the right stood Zach with his acoustic guitar. All night Brent had been asking everyone if they had brought their singing voices, and this was why. As Zach started “45,” the crowd erupted. Brent informed the fans that the first verse was his, the second verse was theirs, and off he went. When the second verse came around, the sound was deafening. Seven thousand voices sang as one. It was obvious by the look on Brent and Zach’s faces that they were more than pleased with the adulation from the fans. Neither of them moved as Brent said, “Mr. Myers, shall we?” and “Simple Man” started to fill the air, much to the satisfaction to the Intrust Bank Arena crowd. Again, Brent sang the first verse, and the fans the second. As the fans finished up, the place went dark and everyone was abuzz with anticipation of the next move. I stood next to the soundboard when the spotlights came on and pointed right at the soundboard. Brent and Zach stood upon it, right in the middle of the arena. There, they finished out “Simple Man” and made their way back to the stage where they closed up shop with “Sound of Madness.” What the fans saw at this show was an awesomely received display of love from three bands who understand where the appreciation for their music comes from and did everything in their power to show the fans how much they appreciate them right back.